Tech Mondays in Kona are typically held on the 4th Monday of the month at the Gateway Center at the Natural Energy Laboratory of Hawai‘i Authority in Kona. Attendees include oceanographers, biologists, electrical and mechanical engineers, computer programmers, computer networking and service people, teachers, business people interested in technology, and many other professionals. Guest speakers generally showcase tech projects in Hawai‘i, especially those that teach something or encourage entrepreneurship. Chancellor Straney was asked to speak about UH System’s plans for STEM education on the island, both in Hilo and at the future Palamanui campus. 04/25/2019 editor’s note: PDF and video of this presentation are no longer available. A team of computer science students from the University of Hawaiʻi at Hilo recently won a national Microsoft competition. The annual U.S. Microsoft Imagine Cup Championship is Microsoft’s premier student technology competition focusing on innovations addressing the world’s toughest problems. The winning UH Hilo team will head to St. Petersburg, Russia, in July to compete in the Imagine Cup Worldwide Finals. The 2013 national finals were held in San Jose, California, and featured the top 10 U.S. teams pitching their ideas and solutions to investors, entrepreneurs, and technology professionals for a chance to win cash prizes and support for their businesses. UH Hilo’s team, comprised of seniors Mike Purvis, Kayton Summers, Wallace Hamada and junior Ryder Donahue from the UH Hilo Department of Computer Science topped the field of competition with their application entitled “Help Me Help,” which focuses on community help for disaster relief efforts. The program aids the community and emergency response personnel in disaster situations by allowing users to upload images of nearby hazards through the use of smart phones. The winning project had its start last summer with a course in software engineering taught by Keith Edwards, associate professor of computer science. In this class, students work together on a year-long project of benefit to a community organization or scientific group. For this particular project, the student team worked with Don Thomas from the Center for the Study of Active Volcanoes on a project allowing tourists to geo-tag invasive plant species on Mauna Kea so that rangers can identify and remove the problem plants. The concept was a perfect fit for a software engineering project. Last November, Michael Peterson, assistant professor of computer science, and team advisor Keith Edwards, took team member Ryder Donahue, who was interested in Microsoft technology, over to O‘ahu using some of Keith’s research funds. There they met with Randy Guthrie, a tech evangelist from Microsoft. Randy was really excited to see a student attending the workshop and encouraged Ryder to enter the software engineering project in the Imagine Cup competition. Ryder returned to Hilo and worked with his software engineering team to make an entry for the Imagine Cup Accelerator Competition, where the submission was named one of the top 15 entries. While at that event, experts from Microsoft suggested to the team that they change their concept to make it a more general disaster response application. So the students pivoted their idea to make the “Help Me Help” application, which they entered into the U.S. finals. Due to their strong performance at the national competition, they were selected as one of the top 10 teams in the U.S. This prestigious win for the UH Hilo team is a perfect example of how our students’ applied learning experiences can have a worldwide impact. Through hard work and creative thinking, these computer science students applied the material taught in the classroom to develop knowledge and capabilities beyond what is presently known in our community. The students’ rewriting of their original idea to then address general disaster response is of benefit not only to our island communities, but to communities around the world. I encourage members of the local Chambers to participate in applied learning projects with our students. For more information, contact Tom DeWitt, director of applied learning experiences, phone 808.987.6551or email tsdewitt (at) hawaii.edu. For more news from the Office of the Chancellor, visit my blog at http://hilo.hawaii.edu/blog/chancellor/. The partnership between the University of Hawai‘i at Hilo and the Hawai‘i Island Chamber of Commerce is helping move UH Hilo’s new strategic plan and mission forward, and I want to thank each of you for your dedication and commitment to the university. As this academic years closes, I’d like to share some accomplishments of 2012-2013 and the good progress made in implementing our strategic plan. The new Office of Applied Learning Experiences, or ALEX, was inaugurated with Tom DeWitt, associate professor of marketing, as director. The ALEX office organized two workshops on resume writing and interviewing skills that attracted over a hundred students. Two internship fairs featured dozens of community organizations and businesses offering internships—thanks to Chamber members for your participation! An internship summit engaged 110 UH Hilo faculty, area teachers, and community members in discussions about how to expand internship opportunities for students. The Office of Research and Economic Development, under interim vice chancellor Dan Brown, has expanded grant and research activity. Exciting research activities include the work of Dana-Lynn Koomoa, assistant professor of pharmaceutical sciences, who received a prestigious early career award from the National Institutes of Health to continue her research on neuroblastoma (a form of cancer). Don Price, professor of biology, is collaborating on a major National Science Foundation grant to examine evolutionary and ecological aspects of Hawaiian islands’ insect diversity. John Pezzuto, dean of the Daniel K. Inouye College of Pharmacy, and Karen Pellegrin, director of continuing/distance education and strategic planning in the office of the dean, received a very large grant from the U.S. Department of Health and Human Services to develop a program linking hospitals with community pharmacists to reduce chances for miscommunication that could lead to harmful drug interactions. planning a UH System Sustainability Summit, which has led to the anticipated development of sustainability policy for the UH 10 campus system. Here at the Hilo campus, new photovoltaic projects will add 486 KW of PV capacity to the campus’s energy generation infrastructure with an estimated savings of $300 thousand. I have appointed a “Hawai‘i Papa O Ke Ao” task force to work on UH Hilo’s part in a broader plan to make the UH System a leader in indigenous education. With community-wide input, the committee is currently gathering information on Native Hawaiian programs, staffing, students and the Native Hawaiian community, and will be submitting its plan and recommendations to me at the end of this semester. 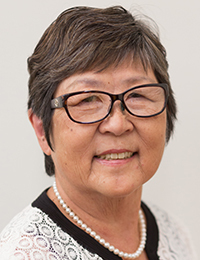 The East Hawai‘i Community Development Corporation recently announced University of Hawai‘i at Hilo Chancellor Donald Straney and Hawai‘i Community College Chancellor Noreen Yamane have joined the organization’s board of directors. East Hawaii Community Development Corporation welcomes to its Board of Directors Chancellor Donald Straney of University of Hawaii-Hilo and Chancellor Noreen Yamane of Hawaii Community College. Straney and Yamane will be instrumental in EHCDC’s efforts to meet its mission of working within and for the community, in particular EHCDC’s educational and workforce development initiatives. Already, both UH-Hilo and HCC have been instrumental partners in the launch of the Hawaii TechWorks program, in particular the design lab at Hawaii TechWorks, which was partially funded by a federal grant UH-Hilo and HCC were critical in helping obtain. I recently attended graduation ceremonies for the first cohort of the Veterans to Farmers pilot training program. Fourteen graduates received their training certificates in Waimea on Jan. 5 at an event attended by family, friends, and Hawai‘i island and state dignitaries including representatives, senators, Mayor Billy Kenoi and Governor Neil Abercrombie. The Veterans to Farmers training program is a community-based pilot initiative that will soon evolve into a new UH Hilo Certificate in Agriculture program designed solely for U.S. military veterans. The program will provide a hands-on farming skills training curriculum, classroom-based business training, business start-up support, and health monitoring for veterans. Once the curriculum is formally approved by the Veterans Benefits Administration of the U.S. Department of Veteran Affairs, the UH Hilo certificate program will be eligible for veterans to use their GI Bill education benefits. Local organizers are currently working with the VA on a start date of UH Hilo’s certificate program. The State Department of Labor—and its director Dwight Takamine in particular—has been instrumental in launching Hawai‘i’s Veterans to Farmers program. Partners in facilitating the program are Rivertop Energy Solutions (a project-planning firm run by David Ruf assisting with development of the initiative), Hawai‘i Community College, the State Department of Agriculture, the Department of Hawaiian Homelands, the Office of Hawaiian Affairs, Mealani Research Station, the Pu‘ukapu Agricultural Community Facility, Native Hawaiian leaders and organizations, several community-based groups, Wow Farm and other local farmers in Waimea on the Big Island. UH Hilo faculty provided technical assistance in the pilot training program. A key goal of the UH Hilo certificate program will be to enable veterans to develop the necessary skills to farm while also addressing the difficulties many face in transitioning back to civilian life after military service. Completion of the certificate program can enable veterans to create new farm businesses, and to meet the requirements to acquire the leases and loans needed to start a farm. Some participants who complete the certificate program will be ready to pursue a bachelor’s degree at UH Hilo in addition to becoming farmers. A lot of the hands-on field training in the pilot program—such as greenhouse building—took place at Wow Farms in Waimea, and that type activity will continue once the UH Hilo Certificate in Agriculture is underway. UH Hilo faculty and lecturers will teach the credit courses in Waimea, and the lab requirements—chemical analysis labs and so forth—will be held at UH Hilo’s North Hawai‘i Education and Research Center in Honoka‘a. There will be seven baccalaureate level courses required including Value Added Ag Products or Man’s Food, Agro-Environmental Chemistry, Sustainable Agriculture, Student Managed Farm Enterprise Project or Directed Work Experience Program, Farm Management, Farm Power, and Principles of Horticulture. Flexibility will be built into the program for substitutions, so, for instance, if a student wants to focus on raising cattle, his or her curriculum could be adjusted to give the student the proper education to meet those business goals. The Veterans to Farmers program is good for veterans and good for the state. Farmers will play a crucial role in the future economic stability of our island and our state as we move toward food security. The U.S. Veterans Benefits Administration wants to see veterans earn advanced degrees to open up opportunities that allow for full participation in society. The Veterans to Farmers program gives veterans the education they need to create their own small businesses on their own farms—it gives them work in which to thrive while supporting their families. I see great potential for this program to grow and expand throughout our island and state.